BUSAN, South Korea - The Archbishop of Canterbury, Justin Welby has made his first appearance at an assembly of the World Council of Churches when he attended the 10th Assembly of the World Council of Churches Asia meeting in Busan, South Korea. Welby was enthroned as Archbishop of Canterbury, the spiritual head of the 80-million strong Anglican Communion, on March 21. He was enthroned for the first time by a woman as the senior cleric of the Church of England. 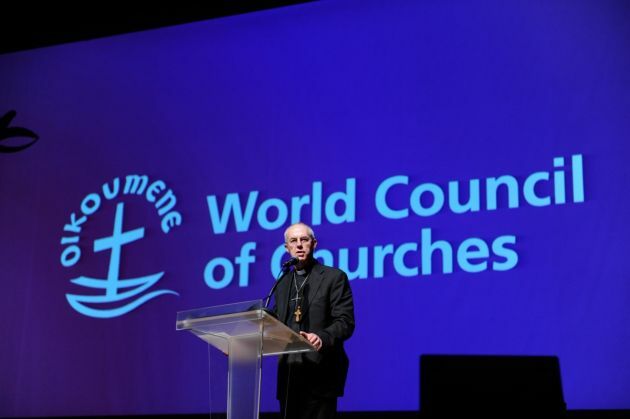 Speaking in Busan at the meeting of the WCC's highest governing body, its assembly, Welby a former banking and oil industry executive, said, "Being here together a fresh vision of that to which we are called. It is an opportunity for genuine encounter, an opportunity to learn about one another and to learn from one another. "We must learn to hear Christ through one another. We renew our commitment to the ecumenical journey and the ecumenical task. We need one another," Archbishop stated during a special meeting on Asia..
Welby said that his predecessors had been given the opportunity to learn in the life of the fellowship through ecumenical activity due to participation. "Ever since the first Assembly at Amsterdam in 1948, Archbishops of Canterbury have been present at Assemblies, a personal sign of how important the fellowship of churches has been, and still is, for Anglicans. "As a result we have sometimes been uncomfortably challenged and even moved to reform ourselves. "Friendship is the seed bed in which unity, the visible unity of the One, Holy, Catholic and Apostolic Church grows and flourishes," the archbishop said. The World Council of Churches 10th Assembly theme this year is to create justice, peace, and unity. Archbishop expressed friendship is an importance to achieve unity. Professor Joshua Rathnam Chinthala, of the Church of North India, explained he has met a lot of people and hopes the people that he has met at the WCC will eventually become life-long friends. "I have met a lot of people so far, and I have gotten to know those who live in different countries; I hope these will turn into life-long friendships," Chinthala told Ecumenical News. "When we look to God our eyes are turned outwards to his world, and we hear again the command, as Pope Francis said, to be a poor church for the poor. "The children of Christ act instinctively to love those who suffer, as He loves us. If justice faints, hope fades. But when justice is loved, and lived, the poor have hope and the whole world begins to sing. One of the guest speakers, YangYa-Chi, a Taiwanese graduate of the University of Cambridge, who gained her master's degree in Modern Society and Global Transformations, related to Welby's statement. She said, "The children of Christ act instinctively to love those who suffer, as he loves us. If justice faints, hope fades. But when justice is loved, and lived, the poor have hope and the whole world begins to sing." YangYa-Chi said, "Jesus never looks down on human sufferings; we as followers of Jesus must help others." Delegate, Archbishop Aristarchos of Constantina from Jersusalem said to Ecumenical News, "I believe that as a Christian, an orthodox Christian, who lives in Jerusalem, in the holy land, in the land in which Jesus Christ lived, as a person, the son of god. I believe that as a member of the church, we have the belief of Jesus Christ, the belief to his mission which is love, reconciliation, peace, and justice." The Archbishop of Canterbury expressed his gratitude on behalf of the Anglican Communion for the opportunity to be a part of the opening of the 10th WCC Assembly.